In 2019 BEpic released a new unique health product for all children in the world. The company BEpic again surprises everyone with new technologies and discoveries in the field of health. The most expensive thing we have is our children, and now, thanks to a new product for children, children will improve their health. The new third product of BEpic is called GR8 Kids. This is a natural food mixture for children. Release form — packaging with 30 sticks in the form of tubes, and weighing 93 grams. This is the first product of the company, which is released not in the form of capsules. The drug’s slogan is Flavor-Packed Nutritional Powerhouse, which translates to something like Aromatic Nutritional Power Plant. There is also a play of English words. After all, the word Powerhouse has two basic meanings — a power station and a very energetic person. Purpose GR8-Kids The purpose of the product is to accelerate the development of the child, to maintain his physical, emotional and mental development. The preparation gives the child energy, good mood, developed mind, good health. The ultimate goal of the product is to ensure that the child never hurts and develops with the maximum physiologically acceptable speed. How to use — to dissolve 1 stick in a glass of room temperature water (or slightly warm) and drink. The content has a pleasant taste and smell, and therefore is easy to use by children. Contraindications — Individual intolerance to individual components of the food mixture. Absolutely no sugar, absolutely no calories super nutrients in very convenient packages 100% natural GR8 KIDS is needed as a daily supplement for healthy natural cellular nutrition. 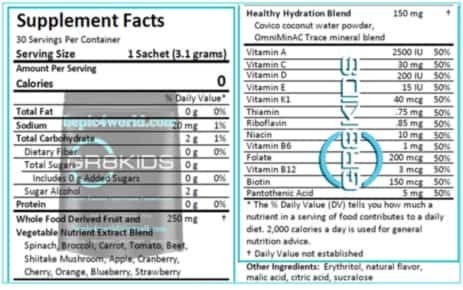 GR8 KIDS is a powerful natural source of nutrition for the brain, heart, muscles. Each package contains several servings of phytonutrients of natural plant vitamins from fresh, whole food fruits and vegetables. Each portion of the product is enriched with microelements and live coconut water powder for moisturizing. GR8 KIDS two flavors of Fruity Blast and Rockin ‘Raspberry. Possessing taste and completely natural, trace elements and supervitamins, GR8 KIDS is useful for children of all ages.